Chop the Bandha kobi into thin slices. Heat a pan ,add the green gram ( muga dali ) and fry till it turns light brown and keep it aside. 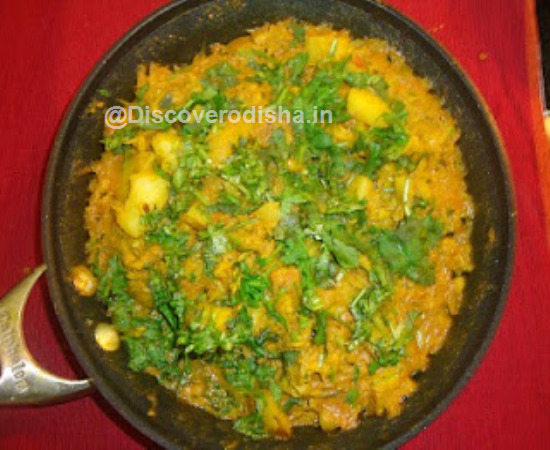 Heat water ( 1/2 cup ) in a pan, add the fried green gram to it. When it starts boiling, add cabbage, salt to taste, stir it properly and cover it with a lid. Allow it to boil on a lower flame till it is properly cooked. Heat oil in another pan, add cloves of pealed garlic and sauté till it becomes light brown. Add the black gram, mustard seed and dry chill .Allow spluttering. Add the boiled cabbage and green gram ( muga dali ) to it,stir it properly and cover with a lid for 1 min. And then at last add shredded coconut and stir it . Serve hot.